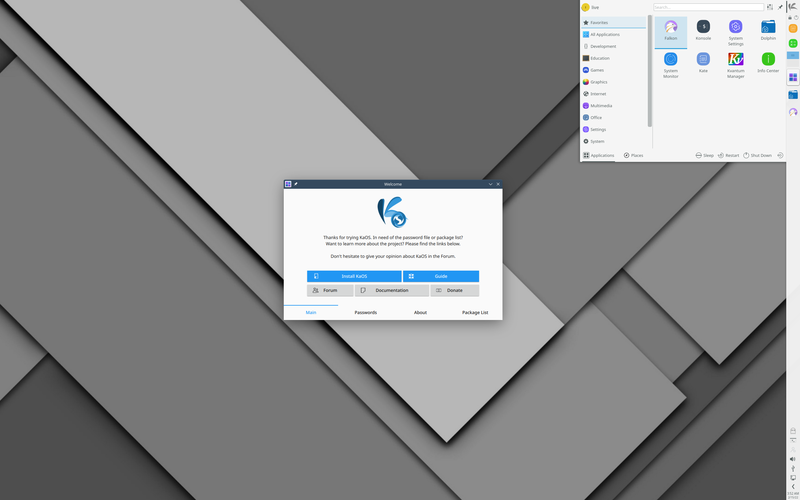 Rate this project Anke Boersma has announced the release of KaOS 2015.06, the latest release of the rolling-release Linux distribution featuring the KDE Plasma 5 desktop: "KaOS is proud to present the 2015.06 ISO image. The policy is, once a first 'pacman -Syu' becomes a major update, it is time for a new ISO image so new users are not faced with a difficult first update. With the magnitude of changes the last two months, the new ISO image is more than due. Most notable major updates are the Boost/ICU stack, GnuTLS/Nettles stack, a new glibc 2.21 and Binutils 2.25-based toolchain, a move to libpng 1.6 series, Linux kernel 4 (4.0.5) and systemd 220. The latter now made the logical step to merge a bootloader with an init system. With this ISO image KaOS moves to the systemd-provided systemd-boot for UEFI installs, while gummiboot is depreciated. With Linux kernel 4.0.5, a much simpler way for users to make sure their Intel microcode is always updated on boot, is implemented. The needed in-kernel modules are now built in such a way that systemd can handle the microcode updates." See the release announcement for more details, screenshots and known issues. Download: KaOS-2015.06-x86_64.iso (1,588MB, MD5, pkglist).